Breakfast has often been a big challenge for me. I want something tasty, but that will stick with me till lunch time. I don't want to be sneaking an unhealthy snack. Recently I found the perfect recipe, "Warm Raw Chocolate Hemp Chia Porridge". I found it on the Manitoba Harvest website, gotta love hemp hearts. This recipe was developed by domesticdiva.ca. For a copy of the bulk recipe, follow the Manitoba Harvest link, makes approximately 14 servings. For a single serving recipe, follow the Domestic Diva link. I used carob powder instead of cocoa powder , and didn't add the stevia. Instead, I served with a teaspoon of real maple syrup and a dollop of soy yogurt. Now for the fun. My son has a very good relationship with his hairstylist, he's more like a family friend. When son told me that it was Aaron's birthday, I thought it would be fun to bake cupcakes and decorate them in hairstyles. Aaron's salon is Precision Hair Gallery in Waterloo, Ontario. What a blast, three of us had a wonderful creative morning. Fortunately I remembered to take photos to share. Each hair style has a name, which we had to explain to Aaron before he would accept them. and Finger waves Cupcake (right). 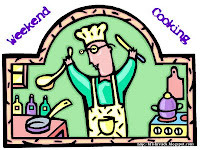 For more foodie fun, be sure to visit Beth Fish Reads for her Weekend Cooking Post. She invites you to add a link to your recent food related post. The purple mohawk one is my favoirte. This is the second time I've seen posts about chia seeds today. Those cupcakes are really neat!! Ha!!!! Love these. And what an awesome decorating job. Oh my goodness! I loved these cupcake hairstyles! I love the cupcake decorating skills, what a neat idea to personalise them in this way. I shall be showing your pictures to my niece when we visit tomorrow, as she loves cooking and cake making. We have sampled cupcakes with just about every flavour variation there is, so this extra special finish would be something new for her to try, as she has lots of interests which would lend themselves so well to decoration! I wholly agree that a good filling breakfast is the best way to start the day. I generally have a bowl of cereal, usually a fruit grain and fibre mix, together with a glass of pure orange juice and the obligatory mug of black coffee to kick start the adrenalin for the day. Very creative cupcakes! Love them.